This year marks the first time that all students at Leaving Cert level will sit the new Project Maths exam. ALMOST 119,000 NERVOUS students will be heading in to state examinations this morning. Close to 58,000 of these are beginning the final leg of their secondary-level education as they sit either Leaving Certificate, Leaving Certificate Applied, or LCVP exams. Just under 61,000 are sitting the Junior Certificate. Last year’s exams were marred by what the State Examination Commission (SEC) branded an “unacceptably high” number of errors on exam papers. It prompted a review of how exam papers were prepared, resulting in some changes to the process. This includes scrutiny of the paper once it is near competition by an expert in the subject, but who has not been involved in setting the paper, in an attempt to weed out any errors. This year also marks the competition of the transition to the Project Maths syllabi for Leaving Cert pupils, with all students at both levels sitting the same exam. These changes were introduced over a number of years, and offers a bonus of 25 points for students who sit the Higher Level paper. This has resulted in an average of 2,000 more pupils taking the examination each year since 2011. Currently 17,065 are due to sit the Higher Level paper this year, but this is likely to fall as students can switch to the Ordinary Level paper on the day of the exam. And let’s not forget students in Libya who also sit the Leaving Certificate exam, a system adopted by Tripoli’s International School of Martyrs in 1997. However, given the unstable situation in the country, these students have been offered the chance to sit their exams in Malta since 2011 after the SEC found it not possible to arrange for exams to be held in Libya. Ireland has, thankfully, been deemed safe enough to hold exams in, but students are still likely to be nervous. The President of the Association of Secondary Teachers, Ireland (ASTI) Sally Maguire said students need to “remember to keep things in perspective”. “You are sitting exams, and that is all they are; they do not define your value as a person,” she said, adding that students should try not to compare or over analyse any exam. Focus on the next exam, rather than the one you have just completed. 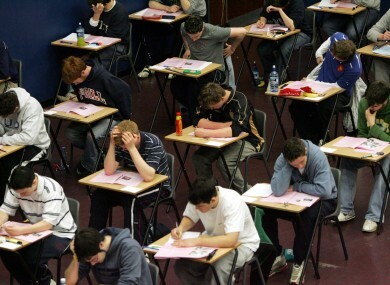 Minister for Education Ruairí Quinn has wished all those sitting exams good luck, and has said that while they are an “important milestone in a young person’s life, they are not the only one”. “There are a vast array of opportunities for education, training and to get new skills throughout their lives,” he noted. Email “Almost 119,000 students are putting pen to paper this morning in state exams”. Feedback on “Almost 119,000 students are putting pen to paper this morning in state exams”.